In woodwork a tool with a flat metal blade fixed to a wooden handle. Used to hew and cut wood into rough shape. An axe with one flat face the better to give a smoother finish. Typically used working downwards on the side of a baulk of timber. An axe with a wide blade. Used for felling trees, a woodsman's axe. A axe is one of the oldest tools known to mankind. From stone age hand axes to modern tool steel. 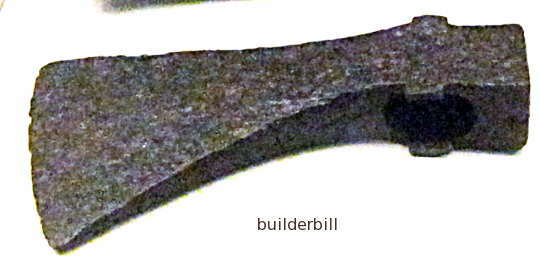 The example above in the British Museum is a Roman military axe head, made in their thousands and used for general woodcutting. The head has what is known as a poll opposite the cutting face. Th is used as a hammer. Above we see part of a shipwright's tool collection at Chatham Dockyard in the UK. The two smaller axes have quite large heads and shorter handles or hafts. 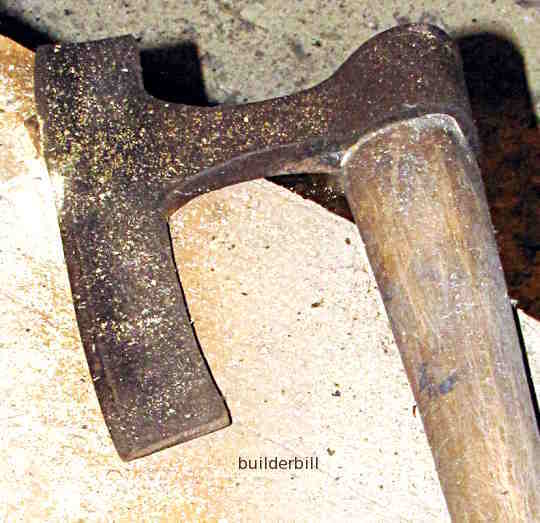 The shorter handles than normal is a characteristic of Shipwrights Axes. This is to allow them to be swung inside the confined spaces of a ship's hull. As a general rule axes of this size (say 6" or 150mm wide blades)and larger were used two handed. At the extreme left of the photo is a long handled Broad axe or woodsman's axe. Also in the photo can be seen a couple of timber cutting adzes. Above we see a side axe dating back to medieval times. 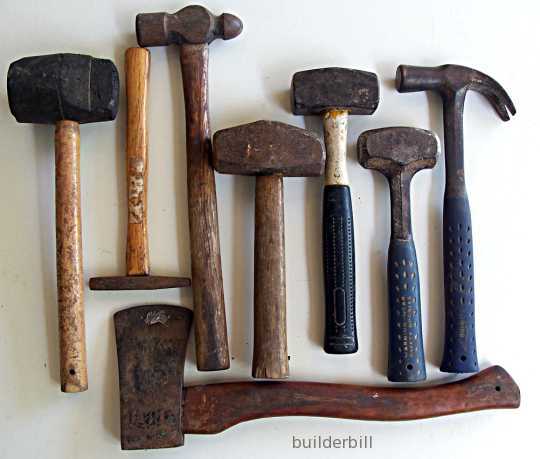 These are quite specific tools for getting a smoother finish to timber. They do have wide blades but the term broad axe does not tell the full story. I have only seen side axes for right handed work but no doubt in the days when these were hand made by blacksmiths then they could have been made left handed also. In the photo above are a few of my own tools. the small axe is a fairly cheap model but it is sufficient as these days it sees almost no use, power saws having taken over the work that we used to use these single handed axes for. 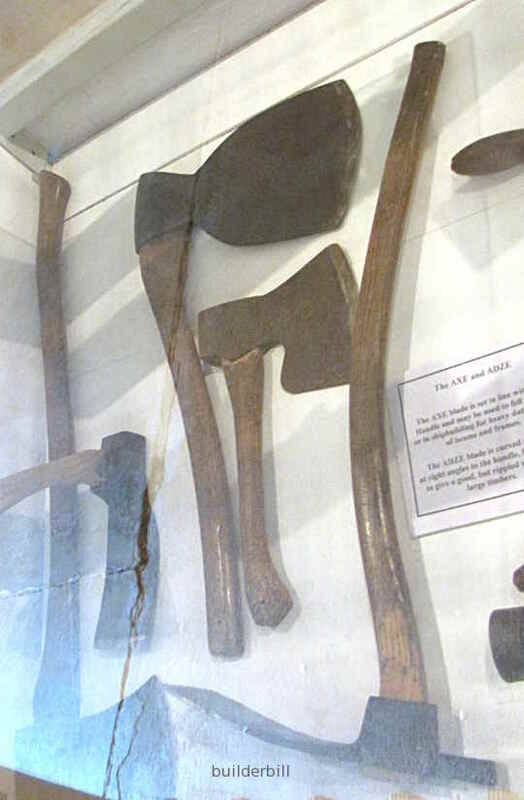 In the US these small one handed axes are known as Hatchets .